Oscar learned his first trick! Since mini pigs have a reputation for being stubborn and spoiled, I am training Oscar so he learns some basic obedience and listening skills. Hopefully these quick training sessions at a young age will help minimize behavior problems as he grows. Here is a video I put together on basic mini pig training and you can see Oscar perform his first trick near the end. I train Oscar with a clicker because I find the click provides a consistent and concise message to him that he’s doing exactly what I asked him to do. Some people use words and that’s fine, but I prefer the clicker as it’s quicker and I don’t forget which praise word I was using and confuse him. For training treats, I keep them small which allows me to do more training without overfeeding Oscar. He likes Cheerios, so I often break them in half for training. I’ve learned that he doesn’t really care how big the treat is, just that he’s getting a treat consistently for each trick done correctly. Occasionally I give larger treats for challenging tricks or just to keep him interested and excited about training, but I try not to overdo it. You can also use cut up carrots, peas, or fruit if your mini pig likes those. When Oscar seems to be bored with the reward, I switch up the treats. Keep the training sessions short, preferably no longer than 2-3 minutes each. I train in two short sessions each day after his meals so that we can make progress without him getting distracted or bored. Training sessions should be fun for you and your mini pig, so if you or your pig is getting frustrated just stop for that session and try again later or the next day. To see Oscar’s first trick, check out the video and watch him circle. 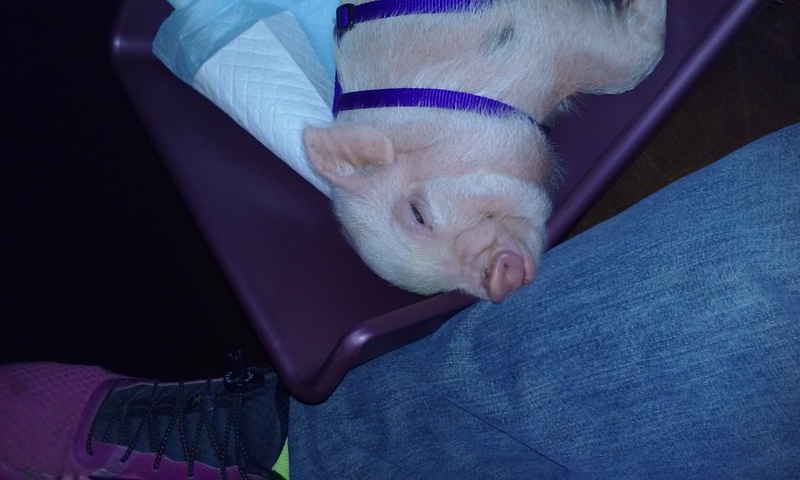 If you want to hear more about mini pig training basics, start from the beginning. If you just want to see the trick, jump in around minute 3.